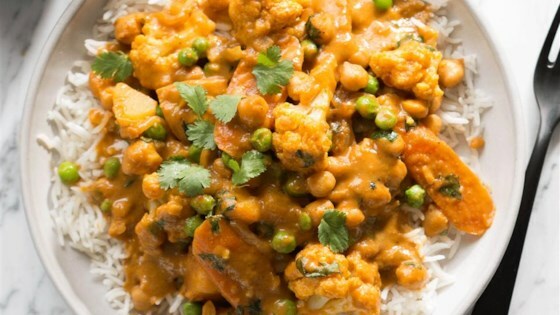 "Coconut milk adds creaminess to this vegan dish, while enhancing the spicier notes." Melt coconut oil in a heavy 4-quart pot over medium heat. Saute onion until lightly browned, 5 to 7 minutes. Add ginger and garlic and saute until fragrant, about 30 seconds. Add curry powder, pepper flakes, broth, soy sauce, maple syrup, and tomato paste and stir. Add potatoes and carrot, cover pot, and bring to a boil. Immediately reduce heat to a simmer and leave lid ajar. Cook just until potatoes are tender, about 10 minutes. Add cauliflower, chickpeas, coconut milk, and cilantro. Stir gently to incorporate. Return to simmer with lid ajar and simmer just until cauliflower is tender, 5 to 7 minutes. Fold in peas and cook until heated through, about 1 minute. Remove from heat and season with salt, if needed. Serve with steamed basmati rice and, for those who'd like more heat, sriracha sauce. Garnish with cilantro. Easy to make and very tasty. I substituted the carrots with mushroom. Delicious over a bed of rice! So good and leftovers are great for lunch! We really enjoyed it, I didn't have coconut oil, so I used olive oil. I used canned, drained pinto beans instead of chick peas but I think I would like chick peas better. I just made this and it is delicious! I will make this again!